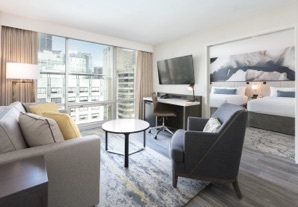 Newly renovated, the hotel boasts guest suites that feature modern décor inspired by the downtown landscape. The hotel is connected to the Morris J. Wosk Centre allowing for easy access to the Conference. Access Pro Bono has negotiated a limited block of rooms at a substantially discounted rate. These rooms are available on a first-come, first-served basis. The group rates are available for stays between October 3 and October 8, 2018. The guaranteed lowest standard room rates during the conference are $179 (CAD) per night. The applicable taxes and fees rate is 17.5%. In order to secure the special conference hotel rate, reservations must be made on or before September 3, 2018. Complete room rates are listed below. Call Marriott Reservations at 1-844-254-5048, ask for reservations, quote the group name ‘Pro Bono Conference’ and provide your arrival and departure dates to book. 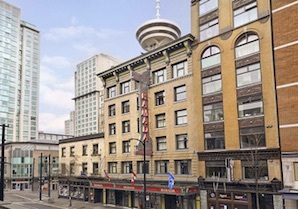 This heritage boutique hotel is located within easy walking distance of many downtown Vancouver attractions. Guests are provided with complimentary hot continental breakfast and complimentary WiFi. This hotel is a 3-minute walk from the Conference venue. Access Pro Bono has negotiated a limited block of rooms at a substantially discounted rate. These rooms are available on a first-come, first-served basis. The group rates are available for stays between October 3 and October 6, 2018. The guaranteed lowest standard room rates during the conference are $139 (CAD) per night. The applicable taxes and fees rate is 17.5%. Call Ramada Reservations at 1-800-854-9517, ask for reservations, quote the group name ‘Pro Bono Conference 2018’ and provide your arrival and departure dates to book.